Below you fill find all funeral homes and cemeteries in or near Solon. Suburbs of Solon: Twin View Heights. Solon is also known as: Johnson County / Solon city. Their current mayor is Mayor Cami Rasmussen. Zip codes in the city: 52333. Johnson County funeral flowers can be purchased from one of the local funeral shops we partner with. Solon has been featured in films like: Zadar! Cow from Hell (1989). Some of the notable people born here have been: Christopher Reed (businessperson). Solon is a city located in Johnson County, Iowa, United States. 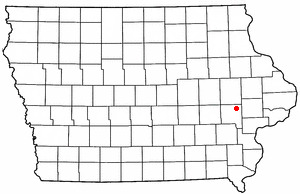 Part of the Iowa City, Iowa Metropolitan Statistical Area, it is located a few miles from Lake MacBride State Park and the larger cities of Coralville and Iowa City. The population was 2,037 at the 2010 census. It was reported on July 26th, 2018 that Margaret Joan Korn (Breza) died in Denver, North Carolina. Ms. Korn was 90 years old and was born in Solon, IA. Send flowers to express your sorrow and honor Margaret Joan's life. It was reported by Des Moines Register on December 12th, 2017 that Donna M Lodermier (Retka) perished in Solon, Iowa. Ms. Lodermier was 84 years old and was born in Little Falls, MN. Send flowers to express your sorrow and honor Donna M's life. It was reported on June 15th, 2017 that Marie Crusinberry (Iverson) perished in Solon, Iowa. Ms. Crusinberry was 93 years old and was born in Brandon, SD. Send flowers to express your sympathy and honor Marie's life. It was revealed by Des Moines Register on March 27th, 2017 that Dennis "Joe" Rosauer died in Solon, Iowa. Rosauer was 72 years old. Send flowers to share your condolences and honor Dennis "Joe"'s life. It was noted by Des Moines Register on November 25th, 2016 that Kay Bottenfield (Moorehead) passed away in Solon, Iowa. Ms. Bottenfield was 91 years old. Send flowers to express your sorrow and honor Kay's life. It was noted on October 21st, 2016 that Leo Leroy Beranek perished in Westwood, Massachusetts. Beranek was 102 years old and was born in Solon, IA. Send flowers to express your sorrow and honor Leo Leroy's life. It was revealed by Waterloo/Cedar Falls Courier on June 2nd, 2016 that Marcella T Cooling (Freeburg) passed away in Solon, Iowa. Ms. Cooling was 91 years old. Send flowers to express your sympathy and honor Marcella T's life. It was noted on March 24th, 2016 that Kathryn A "Kathy" Borowski (O'Flahrity) passed away in Solon, Iowa. Ms. Borowski was 69 years old and was born in Lancaster, WI. Send flowers to express your sympathy and honor Kathryn A "Kathy"'s life. It was revealed on March 5th, 2015 that Lucille Jones (Schulte) passed on in Solon, Iowa. Ms. Jones was 102 years old and was born in Wynot, NE. Send flowers to express your sympathy and honor Lucille's life. It was disclosed by Waterloo/Cedar Falls Courier on August 7th, 2014 that Glenn William Jacobsen died in Solon, Iowa. Jacobsen was 93 years old. Send flowers to share your condolences and honor Glenn William's life. Solon developed along the Old Military Road that connected Dubuque to Iowa City in the 1840s; the road is now State Highway 1. The population was 1,177 at the United States Census, 2000 census. Solon is named for the classical Athenian statesman, lawmaker, and lyric poet Solon. The National Register of Historic Places-listed Stone Academy is just north of town. Ironically, the local high school's mascot is the Spartans; Sparta was famously an enemy of Solon's home, Athens. Solon is a city located in Johnson County, Iowa County, Iowa, United States. The official website for the city of Solon is http://www.solon-iowa.com. She graduated from Solon High School and went onto graduate from Creighton ... She was preceded in death by her parents, four brothers and two sisters. Gay & Ciha Funeral and Cremation Service in Iowa City is caring for Mildred's family and her arrangements. Listing all funeral homes in Solon, Iowa so you can easily send flowers to any location (same day delivery) or find any funeral service. Listing for Brosh Funeral Home in Solon, Iowa, which deals with funerals and cremation. We work with local florists and flower shops to offer same day delivery. You will find budget sympathy flowers in Solon here. Our funeral flowers are cheap in price but not in value.